This afternoon the mayor of Santiago confirmed by telephone to Arlén and his family that tomorrow he will be able to register at Liceo 1 in Santiago. The family received the new after a meeting with the minister Marcela Cubillos and the education seremi, Barbara Soto. 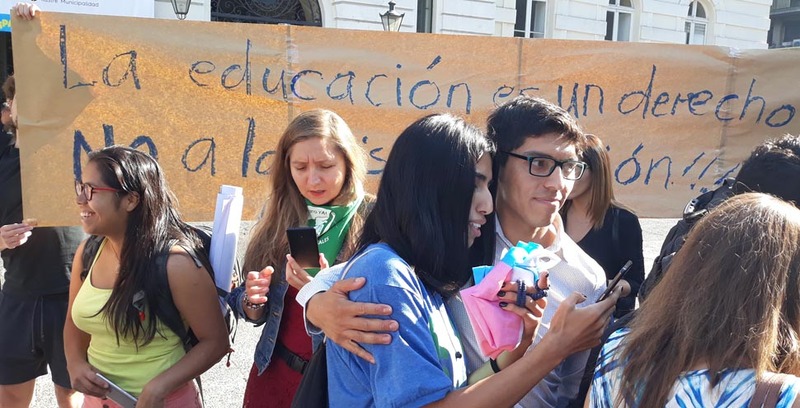 After a successful concentration in the front of the Municipality of Santiago and that the Director of Education of the commune, Yoris Rojas, confirmed a meeting between the Mayor and the Minister, yesterday’s refusal was reversed allowing Arlén to be the first trans student to have access to a high school for girls in Chile. “I am so happy because my petition was heard and my right to education was recognized. This is not a privilege, this is a match of the court and we set a milestone not only at the country level, but also at the international level,” Arlén said. “This recognizes my right to choose the school my daughter wants to go to. Thank you all for joining us,” said Paola Muga, Arlen’s mother. Franco Fuica, in charge of legislation and public policies at OTD Chile, thanked the authorities and stressed the importance of the unity of the trans movement. “Arlén makes history for the community and the authorities as well. You have to understand that this is not just about papers or vacancies, because here we are talking about the right to education and to live one’s identity. We are happy because the enrollment is a message to all transgender children, that the roads open if we are united and that they are not alone.